I’ll admit it; I’ve looked high and low for just the right tool to keep me organized, on task and up to date on all my to-do lists and projects. There are seemingly hundreds of tools and systems that have been created to address this obvious challenge and I’ve tried at least a dozen of them. You’ve got some great ones like GTD, Evernote and Basecamp. I’ve heard from readers about Remember the Milk, Wunderlist and Asana. And, of course, sometimes the good old analog pen and notebook does the trick. I’ve tried any number of digital tools and found that nothing quite stuck. I would use them for a while and then return to my notebook. I never quite understood why I couldn’t get used to using systems and tools evangelized by many until I can across a tool called Workflowy. I have to admit that I encountered it almost a year ago, but dismissed it because it seemed so different and too simple. As it turns out that’s the magic of Workflowy. It’s so simple that you get to design how to use it based on how you think and work and that’s what makes it so powerful. So many other tools I had used required me to think a different way, spend time entering data or adopt new habits to get them to work. You want a tool like to get out of the way and not turn into another thing you have to operate. Workflowy is at its core a giant notepad with a few simple features for navigation, hierarchy, search and sharing and nothing else. In fact, the challenge some people have, including me originally, is that it doesn’t seem to do much of anything. But, it’s the clear and uncluttered work environment that allows you to design how you organize, think and work in the way that fits your style and not the tool designer’s idea of how to work. Workflowy allows me to keep a present picture of all of my projects and tasks and manage this picture with a couple keystrokes. Frankly, I can keep a picture of anything I want in my view – goals, centering thoughts, meeting notes – it’s just a big giant outline of my life. I’ve even added a section for personal and home-related projects. The tool is web based, but iPhone and iPad apps allow you to sync, add and edit across devices. In addition, you can share any element with other Workflowy uses so you can use the tool as a team or even just make one item available to client for collaboration. To me, and of course this could differ from person to person, the key is the structure of the outline. While you can change this anytime you like, getting it right was one of the keys getting more out of it. I started globally with Work and Personal as my two primary catch all bins. The work is then structured by the kinds of work I do. For me it’s speaking, writing and projects. Nested under these items are the notes for each speaking event, blog post ideas, outline and notes for my next book and all the various projects that need my attention such as product creation and promotion. I don’t know about you but my work and personal lives intersect quite often and having a view of personal home projects, exercise, vision, goals and even vacation planning intertwined with my work view is a powerful thing. As your list grows you can expand and collapse views as well as search for any word or phrase. You can also create hashtags that make list making very simple. For example, I use the tag #soon after any task I want to be on the immediate radar. That way I can click on a #soon tag and get what amounts to my daily to-do list. What I love about the outline structure is that my to-do list now is made up from and related to my ongoing worldview and not just from what’s barking loudest or on deadline. Every staff meeting runs from Workflowy and every phone call with a client or meeting planner runs there as well. 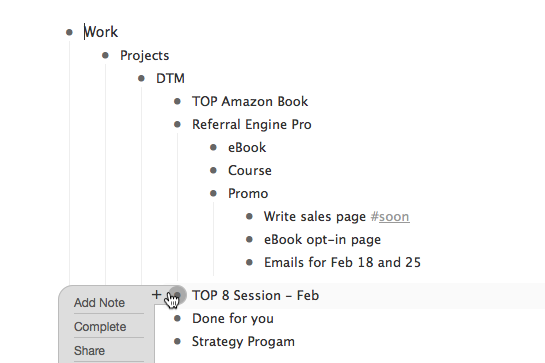 You can also create checklists and common outlines and duplicate them as needed. It took no time at all to get Workflowy into my routine, partly because there are only about a dozens commands and functions and mostly because I could adapt it to the way I already thought about organizing my life. I do still use Google Calendar for appointments, but Workflowy stays up and ready throughout the day and into the night as my planning, organizing and doing tool. There is a free version of Workflowy that will work for most users. You can upgrade to pro for $49 a year if you really want to use the team and sharing functions with lots of people.